How do I download all data from my account? Account admins can download a zip file that contains CSV files of all account data from the account. Data Dump must be enabled for the account. Please contact Bridge Support for help with setup. This feature is not available in Bridge for Teams accounts. In the Tools menu, click the Download All Data link. Click the Create Export button. The status will display as pending once the export begins. The date and time of the export is also displayed and will be automatically updated each time a new data export is created. Note: The export can be cancelled at any time by clicking the Cancel button. Once the download is complete, click the Download button to begin downloading the account data. A zip file of CSV files containing all account data will be downloaded. The data export will include everything from attachment information to user visits within your account. 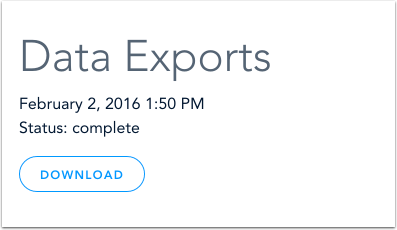 Learn more about the data included in the export. Previous Topic:How do I view an Overdue Learners report for my account? Next Topic:How do I create custom reports for my account? Table of Contents > Manage Reports > How do I download all data from my account? How do I use Bridge as an account admin? How do I create custom reports for my account?